Various case reports of patients with Dandy-Walker variant syndrome mimicking schizophrenia have been published in the last 20 years, suggesting that this neurodevelopment disorder should be part of the differential diagnosis for every patient with a first episode of psychosis. In this report, it is presented that a patient who was diagnosed and treated as a paranoid schizophrenic for 20 years and had four bone fractures secondary to ataxic gait impairment, before performing a neuroimaging examination that revealed Dandy-Walker variant syndrome. Dandy-Walker syndrome was described for the first time by Walter Dandy more than a century ago.1 Forty years later, Arthur Walker reviewed the topic,2 and since then both names became associated with this neuropsychiatric eponym.3 Although rare, it is the most common human cerebellar congenital malformation, characterised by hypoplasia of the cerebellar vermis, cystic dilation of the fourth ventricle and an enlarged posterior fossa with upward displacement of the lateral sinuses, tentorium and torcular.4 There are descriptions of four anatomically different types of the so-called Dandy-Walker complex: malformation (cerebellar vermis agenesis), variant (cerebellar vermis hypoplasia), mega cisterna magna and posterior fossa arachnoid cyst.5 Besides cerebellar ataxic gait and Schmahmann’s cerebellar cognitive affective syndrome (impairments in executive functions, visual–spatial processing, linguistic function and affective regulation6), all these four different types may be present with virtually any kind of psychiatric symptoms, including psychosis and cognitive deficit.7 Various case reports of patients with Dandy-Walker variant syndrome mimicking schizophrenia have been published in the last 20 years,8–14 suggesting that this neurodevelopment disorder should be part of the differential diagnosis for every patient with a first episode of psychosis. A 54-year-old woman with a 20-year paranoid schizophrenia (ICD-9 criteria) history was seen in a communitarian outpatient psychiatric consultation setting for repeated falls. The patient had failed some development milestones in infancy. Nevertheless she completed the fourth grade at school, as an adult, with great difficulty, apparently related to mental retardation. The patient also suffered from hypercholesterolemia and arterial hypertension. The patient had been submitted to four orthopaedic surgical interventions: two left femoral and two right arm Colles’ fractures. The first serious falls occurred 5 years before a unique episode of persecutory delusions and the respective neuroleptic treatment. The other three serious falls and respective orthopaedic surgeries were much more recent, and occurred all in a 1-year time span, after an increase of the neuroleptic treatment dose. The patient’s actual medication was haloperidol 150 mg monthly intramuscular injection, plus daily oral biperiden 4 mg and venlafaxine 150 mg. For two decades, the patient had been previously on an incredible number of different combinations of anxiolytic, antidepressant, antipsychotic, mood stabiliser and antiepileptic medications. Besides obesity, ataxic gait and characteristic facies with palpebral ptosis, there were no other changes in examination. The patient’s mother reported fluctuant clinophilia, irritable mood and impulsive behaviour, but there were no psychotic symptoms. On the patient’s clinical records, a completely innocent electroencephalography was found done 20 years ago, after a unique persecutory delusions episode. However, there was no neuroimaging examination at all. 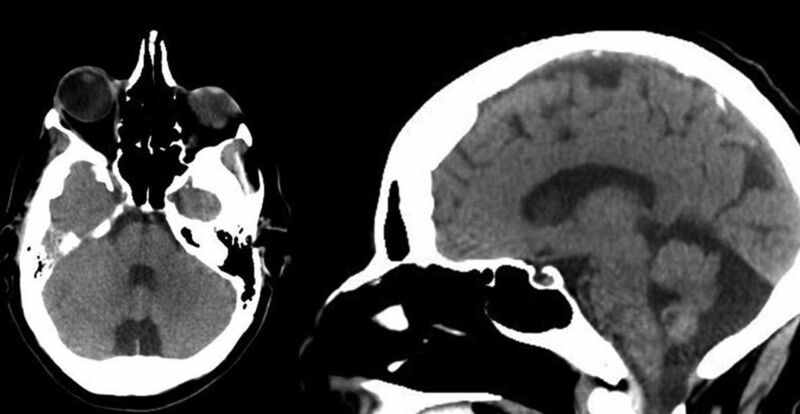 Therefore, for the first time in her life, the patient was referred for a CT scan of the brain that revealed mega cisterna magna with cerebellar vermis hypoplasia and that was compatible with Dandy-Walker variant syndrome (figure 1). Neuropsychological evaluation pointed to moderate dysfunction of verbal, visual and associative memory, suggesting a mild cognitive impairment. Cerebellar vermis hypoplasia and mega cisterna magna. Admitting moderate mental retardation and organic delusional (schizophrenia-like) disorder (ICD-10 criteria), both secondary to Dandy-Walker variant syndrome, we decreased the patient’s long-acting antipsychotic injectable dose to haloperidol 100 mg monthly. Psychoeducation was done, regarding diet and exercise. After approximately 4 years of follow-up, the patient had lost a significant amount of weight and suffered no serious falls or psychotic relapse. More than a handful of patients with Dandy-Walker variant syndrome mimicking schizophrenia have already been reported. Usually, these patients are girls, very young at their first psychotic episode, presenting different combinations of psychotic symptoms and cognitive impairment, and may have up to 10 years before the correct diagnosis is arrived at through a simple brain scan (table 1). One could say that there are studies describing brain volume changes in humans taking chronic antipsychotic medication,15 but we believe that was not the case with our patient, as Dandy-Walker variant syndrome has been widely recognised as a congenital neurodevelopment condition,16 not an iatrogenic neurodegenerative one. On the other hand, there are also studies pointing to cerebellar dysfunction in schizophrenia,17 but again, our patient’s psychosis probably never met the full clinical criteria for a schizophrenia diagnosis. Cognitive and emotional disorder symptoms may accompany cerebellar diseases or be their principal clinical presentation (as happened with our patient), and this has significance for the diagnosis and management of patients with cerebellar dysfunction.18 The patient’s delusional symptoms (and cognitive impairment) could have been more easily explained, we believe, by an organic condition (Dandy-Walker variant syndrome) that was easily detectable through a brain scan that should have been done in the first place. Unfortunately, we still see many patients being diagnosed with schizophrenia without performing a single brain scan. Our case report highlights the importance of neuroimaging for brain lesion exclusion in every psychotic patient. We truly believe no clinician should assume the diagnosis of schizophrenia before neurological lesion exclusion. Only this practice routine may help us avoid an incorrect diagnosis, pernicious neuroleptic treatment and its nefarious consequences.
. Internal hydrocephalus: an experimental, clinical and pathological study. Am J Dis Child 1914;8:406–82. João Gama Marques graduated from the medical school at Faculdade de Medicina da Universidade de Lisboa, Lisbon (2006), where he has also been teaching psychiatry for ten years (2009). He received a European Federation of Psychiatric Trainees’ scholarship in London (2012) and finished his residency in adult psychiatry at Hospital Júlio de Matos, Centro Hospitalar Psiquiátrico de Lisboa, Lisbon (2013). He completed his neuroscience post-graduation at Faculdade de Medicina da Universidade de Lisboa, Lisbon (2014) and was awarded with a Japanese Society of Psychiatry and Neurology’s fellowship in Tokyo (2016) and a European College of Neuropsychopharmacology’s scholarship in Oxford (2016). More recently he received his masters in psychopharmacology from the Neuroscience Educational Institute in Carlsbad (2018). His main interest had been focused on clinical work, research and teaching in the schizophrenia spectrum disorders, but he is also interested in rare neuropsychiatric syndromes with schizophrenia-like psychotic features. Contributors JGM is the sole author of the manuscript.